Injection of soft tissues such as the muscle tendon, bursa or ligament, the joints and the peripheral nerve blocks are extremely useful, in addition to the occupational or physical therapies that combat musculoskeletal pain and disability. These injections are most effective when combined with rehabilitation regimens like stretching and strengthening. Most patients benefit from injections with relief from pain, an increased range of motion and an improved activity. At Apollo Clinic, we understand the uncertainty of illnesses and the importance of medical treatment and injection services. Therefore, providing you with a broad range of injection services that will help you tackle every condition with ease. Injections of local anaesthetic agents or a combination of both, corticosteroids and local anaesthetic agents into the tendon, bursa or joint relieve inflammation or pain and help to restore their function. 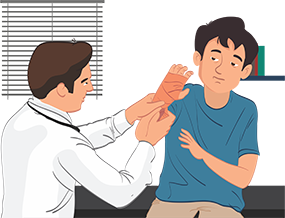 Injection services are often performed by or under the supervision of trained and experienced doctors or nursing staff who establish and coordinate a program of treatment and some secondary prevention. Besides, we also offer injection services for spasticity management through Phenol or Botox injection that is supplemented by appropriate occupational or physical therapies and medications. At Apollo Clinic, we understand the uncertainty of illnesses and the essentiality of medical treatments and injection services. Therefore, we provide you with a broad range of injection services that will help you tackle every condition or pain with ease. With world-class services and facilities, the best doctors and treatment rooms that cater to such services, we assure you a safe treatment, followed by a healthy recovery process.